I had this story emailed to a running magazine and as I type it, I can't help but get mushy. So, forgive me if I have to relay this to you. I am no conservative mother but coming from Catholic school, I see prayer as valuable support system in any race but it was more materialized when I ran my first organized marathon. 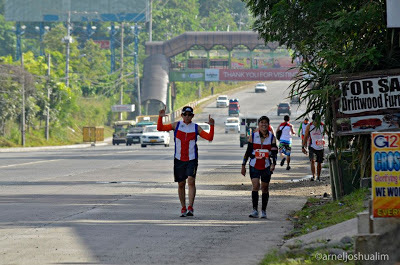 I was completing my 32km practice peak run for Davao Phoenix Marathon 2 weeks before the final race that I got my calf and ankle sprained making me unable to walk nor run. I was so devastated as weeks of training and help from friends would seem to be drained to waste. I sought medical help, bought the needed support and had to skip days of training. My remaining days before the race made me so anxious that I shifted to Yoga. It allowed me to compartamentalize my fear and isolate my pain, and simply focus on getting the routines done. 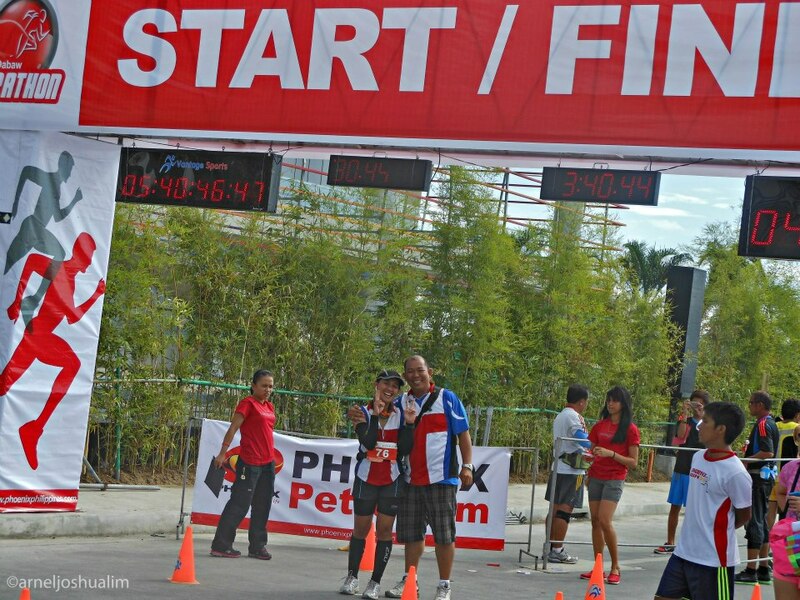 When my prayer prior to the injury was to aim for a better PR, the injury humbled me to ask simply for me to finish the race in spite of what could probably happen during the long hours of running. Not having memorized the rosary, I did my research for what must be the mystery on race day. I memorized it by heart and just relied on faith that everything will be ok.
On race time, I said my prayer silently, recalled my game plan which simply meant following a Galloway technique from kilometer 0. 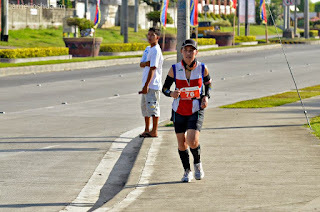 I was doing great, maintaining my pace, however, at kilometer 4, I began to feel hot spots on my right foot. And, I blurted, "BLISTERS! Not Again!" My long beaten shoes finally gave in and the blisters were consuming me. I started praying the rosary but having to run and mind other runners who seemed to be doing well, I kept forgetting the prayers that went with every bead. I ran through the remaining distance and not letting pain consumed my will to complete the race. I allowed myself to cheer for other runners who seemed to be more worse as they dragged their feet as we did our first U - turn completing 21km. My distraction off my blistered foot, got my rosary prayers all messed up, but, I simply said, "Lord, pasenxa na, I can't think straight, I cant say the prayers correctly but I trust that You shall carry me through." 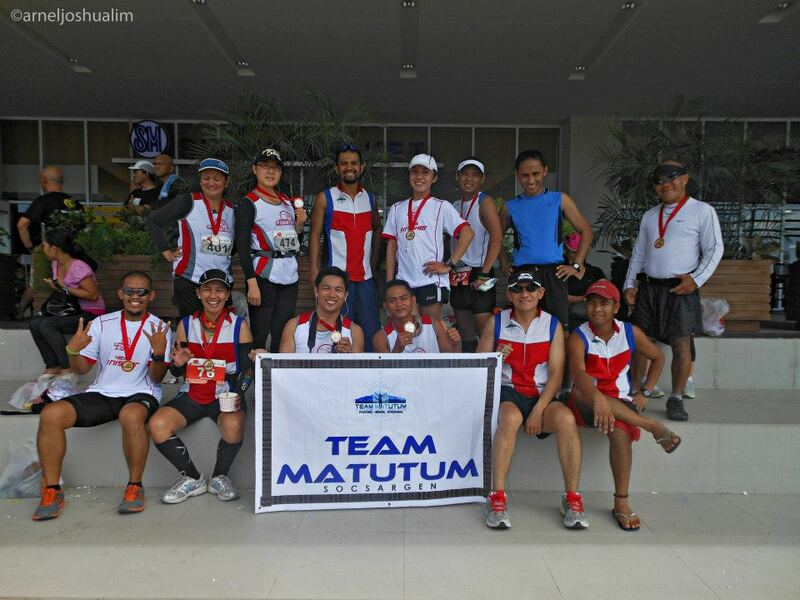 I looked for my other teammates and my slow pacing began taking its toll as I became the last runner from our group. I tried to increase my pacing but as I reached 27th km, by sprained ankle gave way, practically giving in. I shortened my Galloway time for run and increase my time for walking. I continued with my rosary, using only my fingers to count the "Hail Mary's." I attended to my ankle with some ice from a hydration center. I quickly wished for my husband to be around as he joined the rest for team logistics. He along with my trainor - friend gave me some pain cream and worked on some stretches. I continued my race and the blisters and sprain were becoming more pressing. With the ice bath I had on my head, the water began to fill my left shoe that the regular friction had formed to new blisters. I was running then on two blistered feet, and one ankle sprain. My back was already hurting and my rosary seemed forgotten too. At 32nd km, my team mate who was part of the logistics began to run with me and became my pacer. 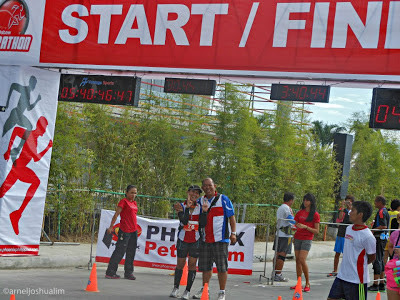 He motivated me to move on with the run and with that act of kindness along with my husband's and my trainor's encouragement, I started doing negative splits with shorter rests in between. I seemed to have repeated the mystery more than twice as I ignored the heat, 5 hours of running and pressing pain. As I was nearing finish line and I saw my husband with his wide grin, I could only thank the Lord for carrying me through. So, whenever I was asked what made my marathon successful, I only mentioned these - prayers, family and friends, training in that particular order.